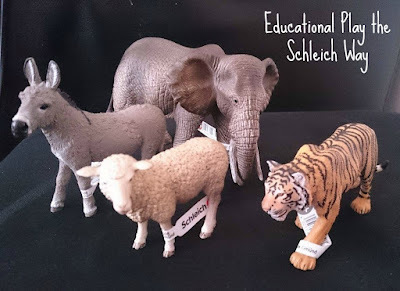 I am a huge fan of Schleich products. They are always C's go-to when we enter Smyths as his favourite type of play is roleplay scenarios with figures. Schleich have recently put together a 16 brochure which is designed to be a guide to the best in imaginative play and development and they have included thoughts from renowned child psychologist, Dr Amanda Gummer. I honestly thought that the brochure would include mostly information that I already knew but it has been a wonderful eye opener for me. We all know how important a balanced diet is for children but they should also have a balanced play diet too. I sort of knew this already but not to the extent included in the brochure. I tend to let my kids watch a little television, C gets 30 minutes of iPad time a day, we do outdoor play and indoor play too. Schleich have also stated that children need Active Play, Creative Play, Social Play and Free Play so they've gone into a little more detail and I really learned a lot and will definitely ensure that my children do these types of playing every day. The brochure encourages you to stimulate your child's imagination with some game ideas. I have to admit that before I had my own children, I wasn't a kid person. I introduced some of these games with C and to be honest, he enjoyed them so much and I did too! It was a really lovely bonding session for the two of us. You can incorporate and use Schleich figures in all of these games and play areas because they are just so versatile. With Active Play we can take our animal figures outside into the beautiful forests near where we live or with Free Play, C can make up his own little scenarios in his head with his animals and imagine how they would interact. One of my favourite games included is What's The Animal? I would choose one of the animals to pretend to be and when C had guessed which one, he'd hold it up. 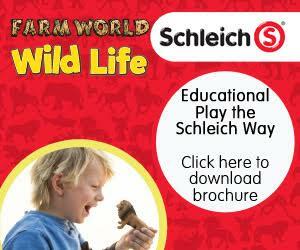 Schleich have an amazing range of products from individual figures to big playsets. We received four animal figures: Elephant, Tiger, Sheep and Donkey. They are such a great weight and size and I do think that aids children's learning. For example the Elephant figure is a lot bigger and heavier than the rest - something which is obviously true in real life too. C loves to ask questions so having these figures has encouraged him to ask me more about these animals and I have loved teaching him. The quality is just fantastic and I know we will definitely be picking up more in the future as I'm sure they will withstand lots of fun playtime in years to come. Even C's 22 month old sister is learning too. She had previously never experienced some of the animals but her big brother has taught her how to say them and make the noises that they would make. I love that Schleich have mentioned the fact that girls can like dinosaurs and boys can like dolls and prams because my son and daughter are exactly like that. Toys are not gender specific. The Schleich range starts at £2.99 per figure and you can pick them up here: http://www.schleich-s.com/en/GB/ or at Smyths. You can also download the 16-page brochure to help your child's playtime by clicking the image below.